I have spent the last three weeks watching someone I love die horribly. It is over. We cannot choose the way we die, only the way we live, so I flew home yesterday and used the time to reflect on another way we might be said to die. Life is lived at the edge. How else would you know you were alive? Safety, security, routine and familiarity can also kill. A man can die incrementally over time, his manhood withering like a leaf in winter. He does not suddenly stop breathing, rather he forgets what it means to live and is buried so slowly he doesn’t even know he’s dead. It takes the rain on his face, a brush with physical danger, or the kiss of a pretty woman, to awaken what remains of his life within. Death in this sense is not a function of age. I have seen young men who were never alive and old men who do not know what it means to die. The knitted cords of domesticity are initially comforting, but they rub, chafe and tighten as we change and evolve, constricting a man’s mind and limbs in unexpected ways. Most succumb as the mind and body find innovative ways to hide the pain. Others break free only briefly, just long enough to bite the apple and gasp with amazement at what they have been missing. 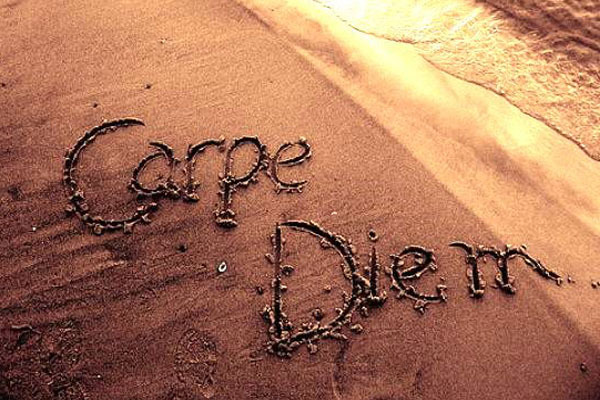 A few seize the day, each and every day. You know who you are. I’m sorry for your loss, yet I also appreciate what you’ve communicated in those few paragraphs. Thanks Chris. Your friendship means a great deal to me. Glad you arrived home safely. So good you are able to reflect at this sad time, he suffers no more and knew you were all with him at the end. RIP quiet, studious man. Have replied to you in a private email. Thank you Anne. I’m glad you liked the post. Great to see you looking forward and ahead, while still pondering your loss. Tremendous words in assessing life, the struggles we all face. Wish you the best. Dalo, thank you, it’s always a pleasure to read your comments. Sally, your prayers meant a great deal to me. Thank you. Extending condolences to you. This post touched me really deeply, as a loved one of mine recently had a brush with what I can’t even put to words (so shaken up). However, I have been thinking a lot since, some before this, about the value of our time/lives in general. Mine. My loved one’s. Everyone somewhat important to me, alot about the males in my family. This is a great post, if I thought for a second each might consider it, I’d share it. But it still rides a train a thought I’ve been nursing, so I appreciate the insights. Thank you for your condolences and I’m so sorry for the suffering of your loved one. Blogging and my blogging friends helped me through this period so I, in turn, am glad you found this post useful. I am too Malcolm. May you sorrows ease over time, with the joy of what you shared the only thing left. Sorry for your loss, but thank you for your words I am at a point in my own life that this message means a great deal. Vio con dios my friend. Just like climbers describe themselves as belonging to the fellowship of the rope I suppose we all belong to the fellowship of the word. Thank you for your kind sentiments and I’m glad the post touched you in a meaningful way. Ahhh Malcolm. I am glad you were able to spend time with your friend. Look after yourself and seize the day. Julia, thank you. It was actually my brother. Poetic, profound, inspiring post as usual, and coincidentally, relevant to my imminent enterprise. My wife and I will be moving from CA to the Free State (http://www.FreeStateProject.org). It will be a risk, an adventure, and a challenge, after having lived in paradise for 25 years. Your blog articulately captures the excitement and daring involved. Malcolm, I’m so sorry for the loss of your brother. Losing those we love does indeed make us reevaluate living, and that’s a gift I think. Take care of yourself. Thank you for your condolences. The gift of salvaging something good from what is bad is a valuable one indeed. Malcolm, this is an intrinsically moving, strong and paradoxically beautiful post! It’s a call echoing through the fabric of life, vibrating of love, demanding aliveness, melting frozen eyes to call out the spark that once were there. It’s a call that will not bow and I hear it! Much love to you Malcolm for your loss and for having the strength, the honesty and open-hearted clarity to write this for the lucky reader to reflect upon. Hanne, your wonderful ‘sensing’ ability has not let you down. You really understood this post and I value that greatly as I do your friendship. Hi Malcolm, I know you are feeling pain from your brother’s death. It is something that never totally goes away. I am also a bit sorry about your response in this post, your leap to being on your own and seeking self in that way. I just returned from Yosemite and it confirms my understanding about life and meaning. Maybe there is no meaning to our existence and we are cosmic dust that, by chance, formed us. It does not matter. On a hike I once more encountered what I feel about living. It’s about the people in our lives and the people we encounter on a snowy path to Vernal Falls: the couple from Holland, the mother with two small children, the young couple, the father and his daughter holding hands. Martin Buber in his book, “I and Thou” explores human meaning as the coming together in an I/thou moment. For him these encounters bring us into the presence of god. I know that being in an I/thou relationship with others gives me joy and meaning. Even dying can help us encounter a spiritual relationship. Birth and Death are profound moments. I wish you healing. I send you my love. Rhea, thank you for these heartfelt words. I am a great fan of ‘I and Thou’, but in order to experience a ‘You’ relationship one has to be able to do so with one’s entire being, something many people are not capable of. Buber himself thought most people treated others as if they were an ‘It’ rather than a ‘You’. Life is not just about people but about standing in a meaningful ‘You’ relationship to them. I think I understand why you thought the post expressed a selfish or self-centered point of view but it was really about freeing oneself to experience whatever is of most value, whether that be solitude, oneness with a godhead or love in a family setting. My post was also unashamedly male-centric. Now that was a worthy read!! Well put my friend! And although You directed most of it towards men (understandably) it’s no different for women. I’ve recently been counseling my 70 year old mother on that very philosophy. Married 50 years to my father, I knew after he died, she would follow if I didn’t push her into the land of the living & forcibly breathe life into her anyway I could. Perhaps we all sleepwalk through life awaiting that electric charge to hit us as life yells “Clear!” For some, it can be stimulation of the mind. Others body; others spiritually. Whatever your charge….feel the breath of life pulse thru you & live! Inion, I’ll drink to that. Cheers. I am really sorry for your loss, Malcolm. Nothing like the death of someone dear to make us evaluate what we call life. Thank you. It’s such a shame that we usually need loss to remind us to do this. You communicated about a problematic topic in a gripping style. Well done. And thank you for sharing your reflections about life and death. Thank you for your condolences Klaus. I’m glad you enjoyed the post and I certainly appreciate your feedback. I fell deeply sorry for the loss of your brother. Thank you for sharing this wit us all. All the comments express what I’m not able to put into words. Dina, thank you for your heartfelt sympathy. It is much appreciated. I’m glad you’ve seen them too. M, this one’s my favorite here to date. Everything about it, the reflections, the depth, diction, images. Love the bite of the apple. I hope the ordeal and this post helped you come back to the land of the living, renewed. this is a wonderful post. thank you for touching my heart and renewing hope. Devynstella, thank you. Comments such as yours makes it all worthwhile.